USF men’s basketball is .500 in conference play this season, but its two conference losses have combined for just a five-point difference. The first was from a buzzer-beating three-point shot against Tulsa and, more recently, from an 82-80 overtime loss to Temple on Saturday. Bulls’ coach Brian Gregory said in a press conference last week that his team would have to play well to win against Temple, and noted that his team needed to play even better as the season goes on. “I thought we did some good things, but not enough good on the road to beat a high-quality team,” Gregory said. “We have to do some things better in order to win some games on the road, but it was a great game with tough kids out there playing every possession." USF shot less than 30 percent from the field in the first half against Temple and went into halftime trailing by 14 points. The Bulls shot 61 percent in the second half and overtime, going 22-for-36 after the break. 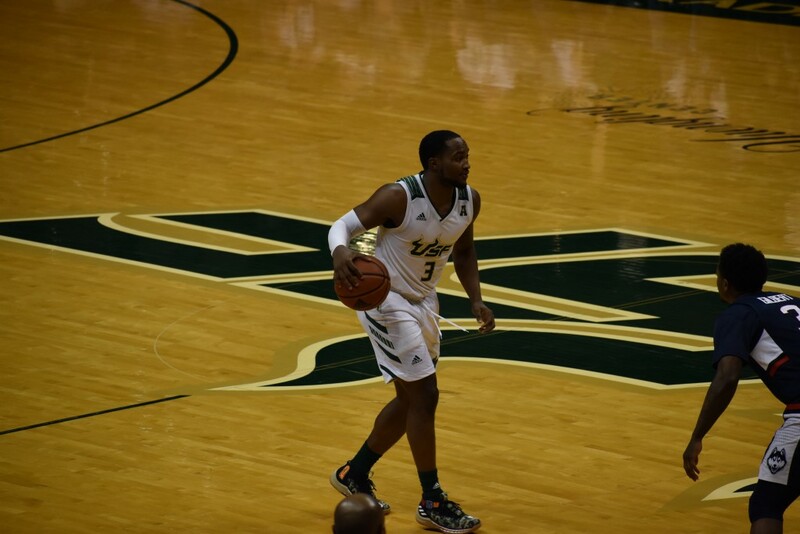 Laquincy Rideau didn’t have an assist in the first half and USF committed nine turnovers. Rideau finished the game with a triple-double, netting 18 points with 10 assists and 10 steals, becoming just the sixth NCAA player in 20 seasons to achieve a points-assists-steals triple-double. The Bulls started the second half with a 27-5 run to bring the game within striking distance before losing in overtime 82-80. The Bulls shot 10-for-25 from the free-throw line in a game that went down to the wire. USF came into the game shooting less than 65 percent from the free-throw line and was just 6-for-16 in the second half and overtime combined. This season, the Bulls are shooting 62 percent and are ranked 340th out of 351 Division I schools from the free-throw line. The Bulls compiled 19 steals in their two-point loss to the Owls, more than doubling their season average of nine steals per game. USF came into the game ranked 20th in the country in steals per game. Rideau had 10 steals to pace the Bulls defense while Collins and sophomore forward Mayan Kiir added three apiece. The Bulls’ bench scored just 12 points and committed five turnovers. Just one game earlier, in a victory over Tulane, the bench accounted for 23 of the team’s 66 points. Against the Owls, Xavier Castaneda played more minutes because of Collins’ foul trouble, scoring five points to lead the bench production. Castaneda was 0-for-2 from the free-throw line.